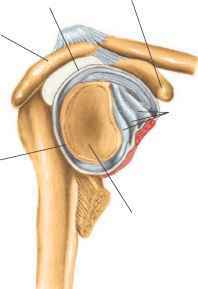 (a) Ligaments hold together the articulating surfaces of the shoulder. (b) The glenoid labrum is a ligament composed of fibrocartilage. the lesser tubercle and the anatomical neck of the humerus. 3. Transverse humeral ligament. 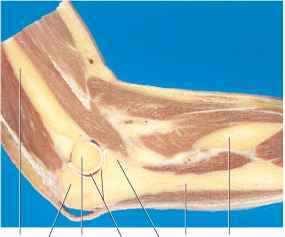 This ligament consists of a narrow sheet of connective tissue fibers that runs between the lesser and the greater tubercles of the humerus. 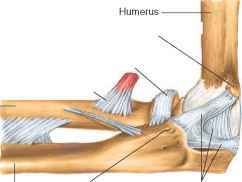 Together with the intertubercular groove of the humerus, the ligament forms a canal (retinaculum) through which the long head of the biceps brachii muscle passes. 4. Glenoid labrum (gle'noid la'brum). This structure is composed of fibrocartilage. It is attached along the margin of the glenoid cavity and forms a rim with a thin, free edge that deepens the cavity. Several bursae are associated with the shoulder joint. The major ones include the subscapular bursa located between the joint capsule and the tendon of the subscapularis muscle, the subdeltoid bursa between the joint capsule and the deep surface of the deltoid muscle, the subacromial bursa between the joint capsule and the undersurface of the acromion process of the scapula, and the subcoracoid bursa between the joint capsule and the coracoid process of the scapula. Of these, the subscapu-lar bursa is usually continuous with the synovial cavity of the joint cavity, and although the others do not communicate with the joint cavity, they may be connected to each other (see figs. 8.13 and 8.14). The shoulder joint is capable of a very wide range of movement, due to the looseness of its attachments and the relatively large articular surface of the humerus compared to the shallow depth of the glenoid cavity. 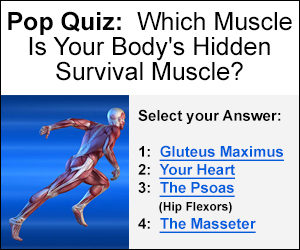 These movements include flexion, extension, abduction, adduction, rotation, and circumduction. Motion occurring simultaneously in the joint formed between the scapula and the clavicle may also aid such movements. Because the bones of the shoulder joint are mainly held together by supporting muscles rather than by bony structures and strong ligaments, the joint is somewhat weak. Consequently, the articulating surfaces may become displaced or dislocated easily. Such a dislocation most commonly occurs with a forceful impact during abduction, as when a person falls on an outstretched arm. This movement may press the head of the humerus against the lower part of the joint capsule where its wall is thin and poorly supported by ligaments. Dislocations commonly affect joints of the shoulders, knees, fingers, and jaw. 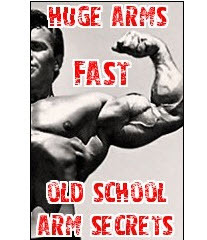 The elbow joint is a complex structure that includes two articulations—a hinge joint between the trochlea of the humerus and the trochlear notch of the ulna and a gliding joint between the capitulum of the humerus and a shallow depression (fovea) on the head of the radius. A joint capsule completely encloses and holds together these unions (fig. 8.15). Ulnar and radial collateral ligaments thicken the two joints, and fibers from a muscle (brachialis) in the arm reinforce its anterior surface. The ulnar collateral ligament, which is a thick band of dense connective tissue, is located in the medial wall of the capsule. The anterior portion of this ligament connects the medial epicondyle of the humerus to the medial margin of the coronoid process of the ulna. Its posterior part is attached to the medial epicondyle of the humerus and to the olecranon process of the ulna (fig. 8.16a). The radial collateral ligament, which strengthens the lateral wall of the joint capsule, is a fibrous band extending between the lateral epicondyle of the humerus and the annular ligament o/ the radius. The annular ligament, in turn, attaches to the margin of the trochlear notch of the ulna, and it encircles the head of the radius, keeping the head in contact with the radial notch of the ulna. The elbow joint capsule encloses the resulting ra-dioulnar joint so that its function is closely associated with the elbow (fig. 8.16b). The synovial membrane that forms the inner lining of the elbow capsule projects into the joint cavity between the radius and ulna and partially divides the joint into humerus-ulnar and humerus-radial portions. Also, varying amounts of adipose tissue form fatty pads between the synovial membrane and the fibrous layer of the joint capsule. These pads help protect nonarticular bony areas during joint movements. The only movements that can occur at the elbow between the humerus and ulna are hinge-type movements— flexion and extension. The head of the radius, however, is free to rotate in the annular ligament. This movement allows pronation and supination of the hand. H Which parts help keep together the articulating surfaces of the shoulder joint? What factors allow an especially wide range of motion in the shoulder? 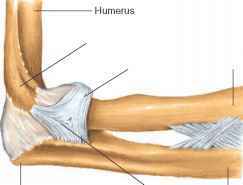 Which structures form the hinge joint of the elbow? Which parts of the elbow permit pronation and supination of the hand? (a) The elbow joint allows hinge movements, as well as pronation and supination of the hand. 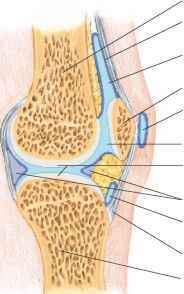 (b) Photograph of the elbow joint (sagittal section). (a) The ulnar collateral ligament, medial view, and (b) the radial collateral ligament strengthen the capsular wall of the elbow joint, lateral view. Arthroscopy enables a surgeon to visualize the interior of a joint and even perform diagnostic or therapeutic procedures, guided by the image on a video screen. An arthroscope is a thin, tubular instrument about 25 cm long containing optical fibers that transmit an image. The surgeon inserts the device through a small incision in the joint capsule. It is far less invasive than conventional surgery. Many runners have undergone uncomplicated arthroscopy and raced just weeks later. Arthroscopy is combined with a genetic technique called the polymerase chain reaction (PCR) to rapidly di agnose infection. Guided by an arthroscope, the surgeon samples a small piece of the synovial membrane. PCR detects and amplifies specific DNA sequences, such as those of bacteria. For example, the technique can rapidly diagnose Lyme disease by detecting DNA from the causative bacterium Borrelia burgdorferi. This is valuable because a variety of bacteria can infect joints, and choosing the appropriate antibiotic, based on knowing the type of bacterium, is crucial for fast and complete recovery. 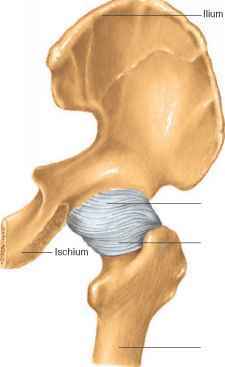 (a) The acetabulum provides the socket for the head of the femur in the hip joint. (b) The pit (fovea capitis) in the femur's head marks attachment of a ligament that surrounds blood vessels and nerves. The hip joint is a ball-and-socket joint that consists of the head of the femur and the cup-shaped acetabulum of the coxa. A ligament (ligamentum capitis) attaches to a pit (fovea capitis) on the head of the femur and to connective tissue within the acetabulum. This attachment, however, seems to have little importance in holding the articulating bones together, but rather carries blood vessels to the head of the femur (fig. 8.17). A horseshoe-shaped ring of fibrocartilage (acetabu-lar labrum) at the rim of the acetabulum deepens the cavity of the acetabulum. It encloses the head of the femur and helps hold it securely in place. In addition, a heavy, cylindrical joint capsule that is reinforced with still other ligaments surrounds the articulating structures and connects the neck of the femur to the margin of the acetabu-lum (fig. 8.18). (a) A ring of cartilage in the acetabulum and a ligament-reinforced joint capsule hold together the hip joint. 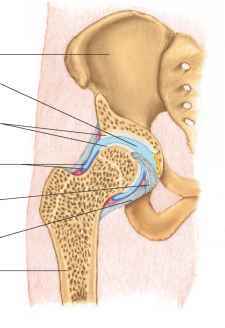 (b) Photograph of the hip joint (coronal section). fibers that connects the anterior inferior iliac spine of the coxa to a bony line (intertrochanteric line) extending between the greater and lesser trochanters of the femur. The iliofemoral ligament is the strongest ligament in the body. The major ligaments of the right hip joint. 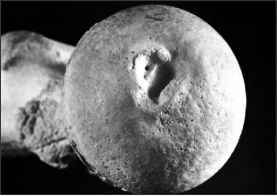 (a) Anterior view. (b) Posterior view. 2. Pubofemoral (pu"bo-fem'o-ral) ligament. The pubofemoral ligament extends between the superior portion of the pubis and the iliofemoral ligament. Its fibers also blend with the fibers of the joint capsule. 3. Ischiofemoral (is"ke-o-fem'o-ral) ligament. This ligament consists of a band of strong fibers that originates on the ischium just posterior to the acetabulum and blends with the fibers of the joint capsule. 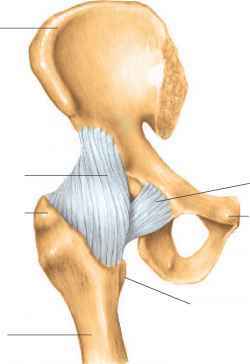 Muscles surround the joint capsule of the hip. The articulating parts of the hip are held more closely together than those of the shoulder, allowing considerably less freedom of movement. The structure of the hip joint, however, still permits a wide variety of movements, including extension, flexion, abduction, adduction, rotation, and circumduction. The hip is one of the joints most frequently replaced (Clinical Application 8.1). 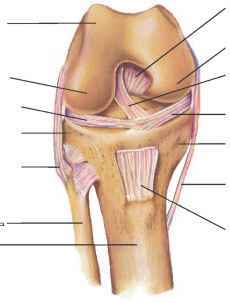 The knee joint is the largest and most complex of the synovial joints. It consists of the medial and lateral condyles at the distal end of the femur and the medial and lateral condyles at the proximal end of the tibia. In addition, the femur articulates anteriorly with the patella. Although the knee functions largely as a modified hinge joint (allowing flexion and extension), the articulations between the femur and tibia are condyloid (allowing some rotation when the knee is flexed), and the joint between the femur and patella is a gliding joint. The joint capsule of the knee is relatively thin, but ligaments and the tendons of several muscles greatly strengthen it. For example, the fused tendons of several muscles in the thigh cover the capsule anteriorly. Fibers from these tendons descend to the patella, partially enclose it, and continue downward to the tibia. The capsule attaches to the margins of the femoral and tibial condyles as well as between these condyles (fig. 8.20). 1. Patellar (pah-tel'ar) ligament. This ligament is a continuation of a tendon from a large muscle group in the thigh (quadriceps femoris). It consists of a strong, flat band that extends from the margin of the patella to the tibial tuberosity. 2. Oblique popliteal (o'blek pop-lit'e-al) ligament. This ligament connects the lateral condyle of the femur to the margin of the head of the tibia. Surgeons use several synthetic materials to replace joints that are severely damaged by arthritis or injury. Metals such as cobalt, chromium, and titanium alloys are used to replace larger joints, whereas silicone polymers are more commonly used to replace smaller joints. Such artificial joints must be durable yet not provoke immune system rejection. They must also allow normal healing to occur and not move surrounding structures out of their normal positions. Before the advent of joint replacements, surgeons removed damaged or diseased joint surfaces, hoping that scar tissue filling in the area would restore mobility. This type of surgery was rarely successful. In the 1950s, Alfred Swanson, an army surgeon in Grand Rapids, Michigan, invented the first joint implants using silicone polymers. By 1969, after much refinement, the first silicone-based joint implants became available. These devices provided flexible hinges for joints of the toes, fingers, and wrists. Since then, more than two dozen joint replacement models have been developed, and more than a million people have them, mostly in the hip. A surgeon inserts a joint implant in a procedure called implant resection arthroplasty. The surgeon first removes the surface of the joint bones and excess cartilage. Next, the centers of the tips of abutting bones are hollowed out, and the stems of the implant are inserted here. The hinge part of the implant lies between the bones, aligning them yet allowing them to bend, as they would at a natural joint. Bone cement fixes the implant in place. Finally, the surgeon repairs the tendons, muscles, and ligaments. As the site of the implant heals, the patient must exercise the joint. A year of physical therapy may be necessary to fully benefit from replacement joints. 3. Arcuate (ar'ku-at) popliteal ligament. This ligament appears as a Y-shaped system of fibers that extends from the lateral condyle of the femur to the head of the fibula. 4. Tibial collateral (tib'e-al ko-lat'er-al) ligament (medial collateral ligament). This ligament is a broad, flat band of tissue that connects the medial condyle of the femur to the medial condyle of the tibia. 5. Fibular (fib'u-lar) collateral ligament (lateral collateral ligament). This ligament consists of a strong, round cord located between the lateral condyle of the femur and the head of the fibula. In addition to the ligaments that strengthen the joint capsule, two ligaments within the joint, called cruciate (kroo'she-at) ligaments, help prevent displacement of the articulating surfaces. These strong bands of fibrous tissue stretch upward between the tibia and the femur, crossing each other on the way. They are named according to their positions of attachment to the tibia. Thus, the ante rior cruciate ligament originates from the anterior inter-condylar area of the tibia and extends to the lateral condyle of the femur. The posterior cruciate ligament connects the posterior intercondylar area of the tibia to the medial condyle of the femur. The young soccer player, running at full speed, suddenly switches direction and is literally stopped in her tracks by a popping sound followed by a searing pain in her knee. Two hours after she veered toward the ball, her knee is swollen and painful, due to bleeding within the joint. She has torn the anterior cruciate ligament, a serious knee injury. Two fibrocartilaginous menisci separate the articulating surfaces of the femur and tibia and help align them. Each meniscus is roughly C-shaped, with a thick rim and a thinner center, and attaches to the head of the tibia. The medial and lateral menisci form depressions that fit the corresponding condyles of the femur (fig. 8.21). 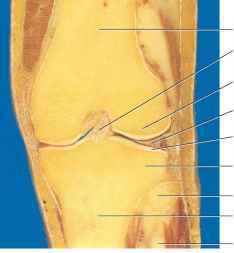 (a) The knee joint is the most complex of the synovial joints (sagittal section). 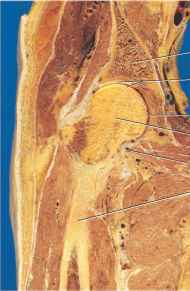 (b) Photograph of the knee joint (coronal section). Ligaments within the knee joint help to strengthen it. (a) Anterior view of right knee (patella removed). 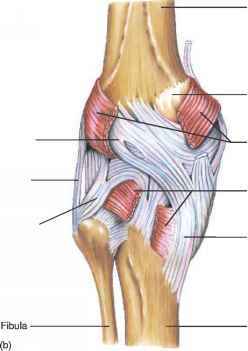 (b) Posterior view of left knee. Several bursae are associated with the knee joint. These include a large extension of the knee joint cavity called the suprapatellar bursa, located between the anterior surface of the distal end of the femur and the muscle group (quadriceps femoris) above it; a large prepatellar bursa between the patella and the skin; and a smaller infrapatellar bursa between the proximal end of the tibia and the patellar ligament (see fig. 8.8). As with a hinge joint, the basic structure of the knee joint permits flexion and extension. However, when the knee is flexed, rotation is also possible. Clinical Application 8.2 discusses some common joint disorders. Tearing or displacing a meniscus is another common knee injury, usually resulting from forcefully twisting the knee when the leg is flexed. Since the meniscus is composed of fibrocarti-lage, this type of injury heals very slowly. 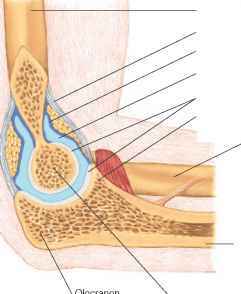 Also, a torn and displaced portion of cartilage jammed between the articulating surfaces impedes movement of the joint. Following such a knee injury, the synovial membrane may become inflamed (acute synovitis) and secrete excess fluid, distending the joint capsule so that the knee swells above and on the sides of the patella.